The River Thames Visitor Centre is located on an very unique historic vessel which is probably the only one left of its kind - the "Duke Class" Thames Lighter. Twelve great Victorian Thames Lighters were named to honour the twelve children of King George III. Prince Adolphus was born in Buckingham Palace. He was tutored at home before being sent to the University of Gottingen in Germany in 1786. In 1791, he went to Hanover to receive military training and rose to Colonel in 1794. By 1803, he was appointed Commander-in-Chief of the newly founded King's German Legion. King George III created him Duke of Cambridge, Earl of Tipperary and Baron of Culloden on 17th November 1801. The Duke served as Colonel-in-Chief of the Coldstream Regiment of Foot Guards from 1805 (Coldstream Guards after 1855). 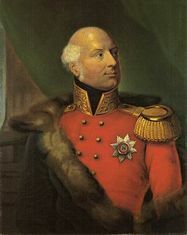 The Duke of Cambridge was married first at Kessel and then at Buckingham Palace to his second cousin Augusta (1797 - 1889), the third daughter of Prince Fredrick of Hesse. The Duke was the maternal grandfather of Mary of Teck, consort of George V. Prince Adolphus is therefore the great-great-grandfather of our gracious Queen Elizabeth II. The Duke of Cambridge was buried at Kew Gardens, (take a trip to find his monument), later his remains were moved to St Georges Chapel, Windsor. Adolphus had a son, Prince George the Second Duke of Cambridge (1819 - 1904). George was born at Cambridge House in Hanover, Germany. The Second Duke was educated in Hanover and like his father served in both the German and British military. He was appointed General Commander- in-Chief of the British Army from 1856 to1887. There is a statue of the Second Duke on Whitehall, London. He married in contravention of the 1772 Royal Marriages Act; so with his death in1904 the title of the Duke of Cambridge became lost. However with the appointment of Prince William in 2011 as the 3rd Duke of Cambridge, the title has been restored and safeguarded into the future. After completing his studies at Eton, the Prince took a gap year, during which he took part in British Army training exercises in Belize, and, for ten weeks, taught children in the town of Tortel, in southern Chile, as part of the Raleigh International programme. It was during his time in the latter location that he lived with other young teachers, sharing in the common household chores, including cleaning the toilet, and also volunteered as the guest radio jockey for the local radio station. By 2001, William was back in the United Kingdom and had enrolled, under the name William Wales, at the University of St Andrews. He was commissioned as a lieutenant in the Blues and Royals regiment of the Household Cavalry and, two years later, earned his wings by completing pilot training at Royal Air Force College Cranwell. In 2009, the Prince transferred to the Royal Air Force, was promoted to flight lieutenant and underwent helicopter flying training in order to become a full time pilot with the Search and Rescue Force. In Autumn 2010, he completed his general and special-to-type helicopter training and he is now at RAF Valley on No. 22 Squadron performing co-pilot duties on board a Sea King search and rescue helicopter. Although the River Thames Visitor Centre - Thames Lighter was named and is In Memory of Prince Adolphus - one of the twelve; we are all proud that the title has been restored - long live the Duke of Cambridge.